Photographer Benjamin Von Wong worked with Dell to 'resurrect' 4,100 pounds electronic waste (the average created in a lifetime) into gorgeous art. 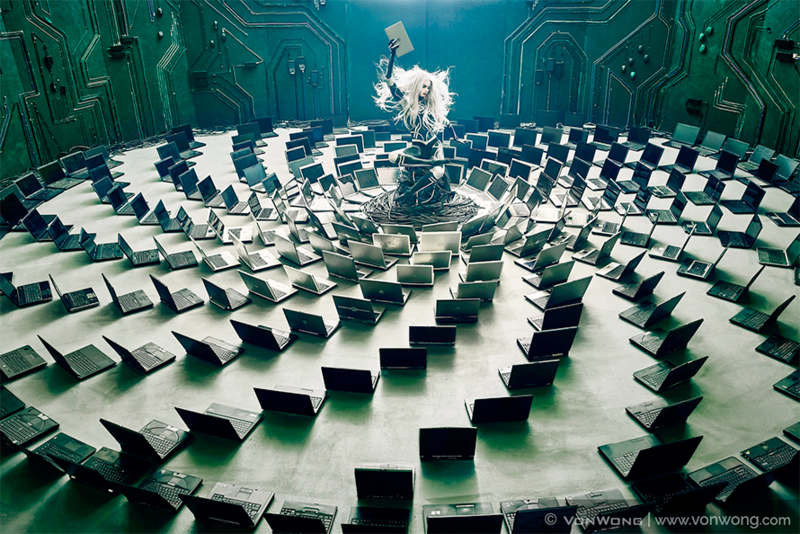 At South by Southwest in 2017, photographer Benjamin Von Wong learned that Dell was working with artists to raise awareness of the computer giant’s electronics recycling program, and he decided he wanted to participate. A year later, the ensuing collaboration has yielded jaw-dropping results—namely a trio of elaborate photographs shot in Wong’s hyper-realistic style. Launched last month, the images use thousands of old computer components to create stunning backdrops for a body-painted model striking stark poses with science fiction overtones (for some, it might evoke The Matrix). All that, to show how the massive tonnage of garbage from an ever-more computerized world could be repurposed into something new and beautiful—in a word, resurrected. 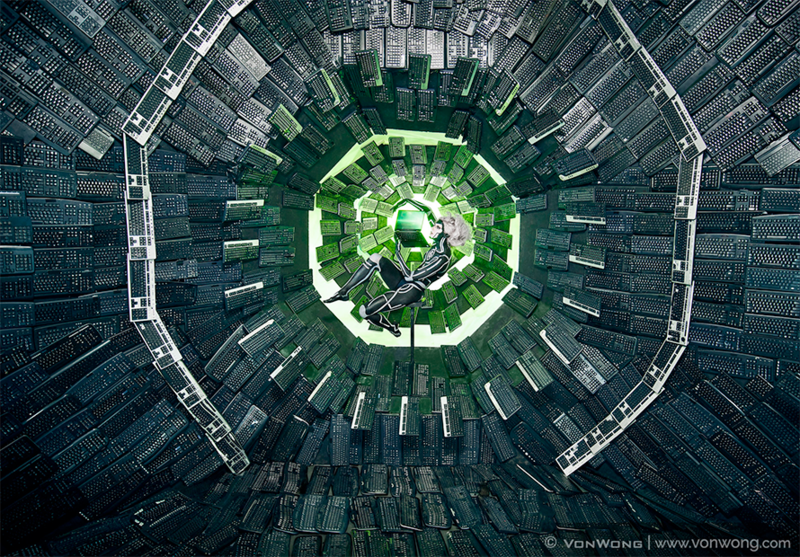 A blog post on Wong’s website describes in detail how the shoot came together, with a crew of 50 volunteers working for 10 days to sift through 4,100 pounds of electronic waste (the average amount created in one American’s lifetime) and assemble it into the gigantic sculptures that appear in the photographs. In the end, the images themselves are so striking that a making-of video understandably declares “This is not a painting,” in capital letters. Naturally, though, the finished structures themselves only lasted a day before being deconstructed and put back into the recycling stream at Wistron GreenTech in Dallas, Texas—the Dell partner that hosted the shoot at its facilities, and provided the necessary computer parts. (Dell ultimately turns old computer parts into new ones in a “closed-loop” recycling program—”essentially using the past to power the future,” writes Wong). Adweek: Given the wealth of possible computer components and accessories, how did you decide to use three sets—one for circuit boards, one for keyboards, one for laptops? 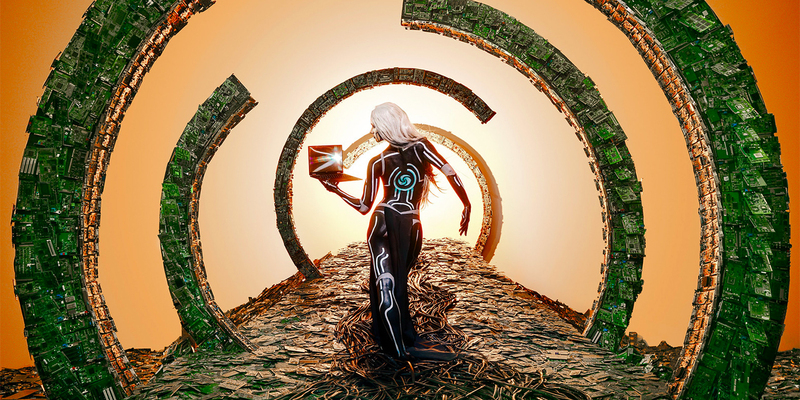 Benjamin Von Wong: We wanted these images to represent the reality of Dell’s closed-loop recycling program. They pointed out the most relevant bins of materials, and I selected those three out of the batch as the most photogenic and recognizable. The video says the final artworks grew out of experimentation with the parts. How did you come up with the initial concepts for where to start on each? How much of it was planned out in advance and how much of it evolved over the course of production? The basic concept of transforming something boring into something extraordinary was there from the start. [Dell] had really enjoyed my previous campaign to raise awareness for plastic pollution and wanted something in a similar vein for electronic waste. We agreed that the overall message should be positive, and so the core concept was to showcase how past electrics could be used to power future devices. We had a general idea of what we wanted to create but the specifics continued to evolve throughout the creation of the project. Adding cables in the portal for example, was a last minute decision the model came up with. I’m a firm believer of trying to get the best results and not settling for good enough! You initially approached Dell about this project. To be clear, did the brand compensate you for your work on it, or just help out with sourcing materials and the baseline budget necessary to bring it to life? Was this paid brand work or a pro-bono passion project? Neither, actually—this was a collaborative partnership where Dell gave us complete creative freedom provided that it stayed within brand guidelines. Although a few members, including myself, were compensated for their time, all did it for less than their commercial rates because it was for a good cause.